You’ve acquired your new Montreal condo and it’s decorating time. It’s a fun creative task that can become overwhelming really quickly if you get card swipe happy or aren’t well prepared. No matter what, you can always optimize your space to its full potential with some tips and tricks to get the best for your buck and feel a rush of relief when you make your new condo your home. Make it your own: This space is your sanctuary after a long day, a place you are excited to show off to friends and family, make it a condo you are proud to call home. Just because your friend decided to become an interior designer overnight does not mean you have to take their advice. Listen, look around, but only do what makes you happy. A condo isn’t just furniture, think of the little accessory details. Be it, a long mirror you place over your bed, plants (real or fake) to place in the empty corners, paintings and picture collages, or candles, do you. Plan ahead: Stay ahead of the game. If you’re going to remodel, do it before any of your stuff is moved in, instead of making a war zone of clutter. Start looking at color palettes that interest you, Ikea or other designer flip books, pinning decor on Pinterest to get ideas for your likes and dislikes. Make sure to measure every single room, double check, so when moving day comes everything fits like a perfect game of Tetris. Budget: Set one. A budget doesn’t mean that you have to sacrifice your home and style for it, you can always find alternatives to fit your design needs. Don’t get lazy and just buy to buy and end up having to stay home with your debt. Understand that not all furniture and accessories have to be brand new. Stalk out garage sales for hidden treasures and get your bargain on, check out Kijiji and Craigslist, or even ask family and friends if they have anything you can adopt. Look for do it yourself options with what you already own or by buying minimal items that takes more manual labour but comes out looking fabulous. 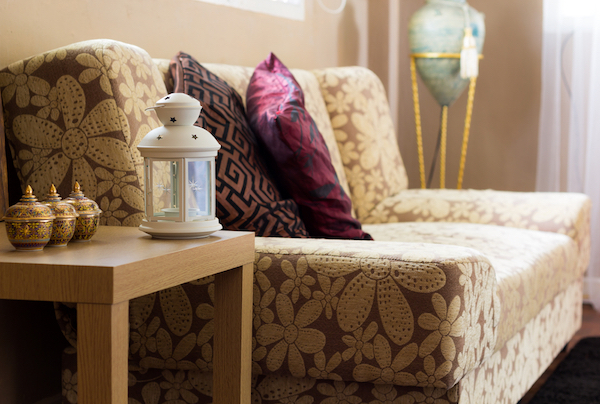 Just because an item is outdated doesn’t mean you can’t update it by reupholstering or repainting. Look beyond the labels and recreate where the item is supposed to be like using shower curtains, which are less expensive as window curtains. Storage: Whether this condo is your first home, or you’re downsizing from a house, storage in a condo is tricky. You might get lucky and have an extra storage unit or cabano, but whatever the case is, your condo will fill up real quick without creative spacing. It can be as simple as getting storage drawers that fit under the beds, or simply going through everything before the big move to be realistic and only keep what you really need. It’s -30 and all you want is an oversized hoodie but your drawers are filled with shorts and tank tops. Find the time to take out summer clothes and switch it out for your winter wardrobe and vice versa. Take all your clothes out and use a vacuum sealed bag to eliminate clutter. Some other examples are accessories with dual utilities like: ottomans or coffee/living room tables that have a secret storage space, a murphy bed that makes for an office by day and guest room by night, pull out drawers in kitchen pantries, etc. Color: Less might sometimes mean more when it comes to choosing colors for your condo. Choose a few color pallets and look over it daily, if each day you still love it and don’t grow to hate it it’s clearly a keeper. Keep fluidity in your home with a color scheme that matches seamlessly from room to room. The worst thing you can do is overdo and make every room a different color pop that makes you or your guests have mini epileptic episodes. Wallpaper is always an option as well, as long as you understand that there is such a thing as too much wall paper and to make sure it’s heat resistant and doesn’t start peeling off. A black ceiling creates the illusion of height and more space if you don’t have those dreamy high ceilings. And as much as you’ve always wanted a red room, inspired by Christian Grey or nah, think that colors affect your mood and energy. For example red is said to be a color that makes you lively and hard to sleep, opt for maybe doing one wall with a pop of color and accessorizing the room with that color to make it come alive. Take your time, not all decorating has to be done immediately. Get your basic staples, and add on as you go. The worst thing you can do is rush decorate and buy just because, which might not necessarily be what you wanted, and leave you with nothing but negative vibes in your Montreal condo.